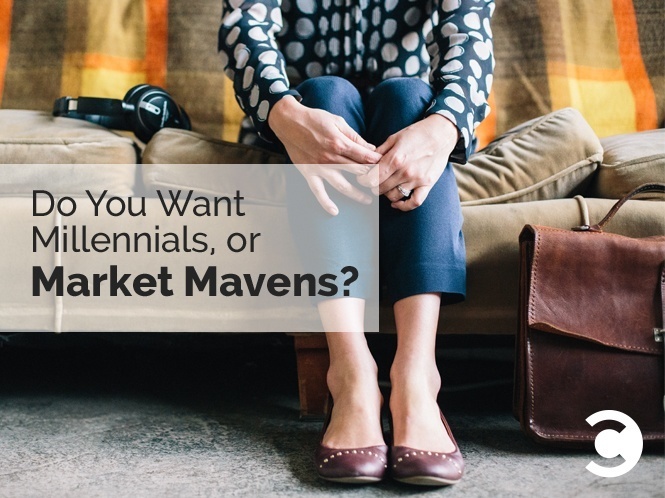 Do You Want Millennials, or Market Mavens? As a consumer research data company, CivicScience’s clients and stakeholders are often looking for insights about Millennials. This is not surprising, given the massive attention to Gen Y and the importance placed on them as the poster children of a new consumerism mindset. But looking only at a group of consumers based simply on their age is not adequate. Just because they are from the same generation doesn’t make them equal in how they approach purchases, media, lifestyle decisions, and brand choice. Instead, we’ve recently been focusing a lot of our own research at CivicScience on a segment that is not defined by demographics: Market Mavens. This group is one we flag for their “psychographic” attributes that include both a tendency to try new products or brands before others and to more eagerly tell others what they think about those products and brands. Essentially, the Market Maven is the combination of an early adopter and evangelizer . We also find that Market Mavens tend to stay on top of trends in categories of their interest much more readily than others. Those characteristics should make Market Mavens a powerful ally and influencer for marketers and advertisers. Having these taste-makers/knowledge brokers/trendsetters on your side may pay off more than just focusing on Millennials. Let’s start by sharing some numbers to tell you more about the profile of a typical Market Maven, based on data we collected from over 11,000 U.S. consumers, 13 and older, in all of 2014. Demographically, they look pretty similar to the general population, with a few small differences: They are 18% more likely to be aged 25-44 and 14% more likely to earn over $75,000 in annual household income. When it comes to technology usage, Market Mavens love their devices; 60% of them own a tablet computer and 79% of them use a smart phone. They are 72% more likely to “second screen” (i.e., use multiple devices at the same time) and 22% more likely than the general population to say they’re addicted to those devices. They are also 65% more likely to value mobile apps. 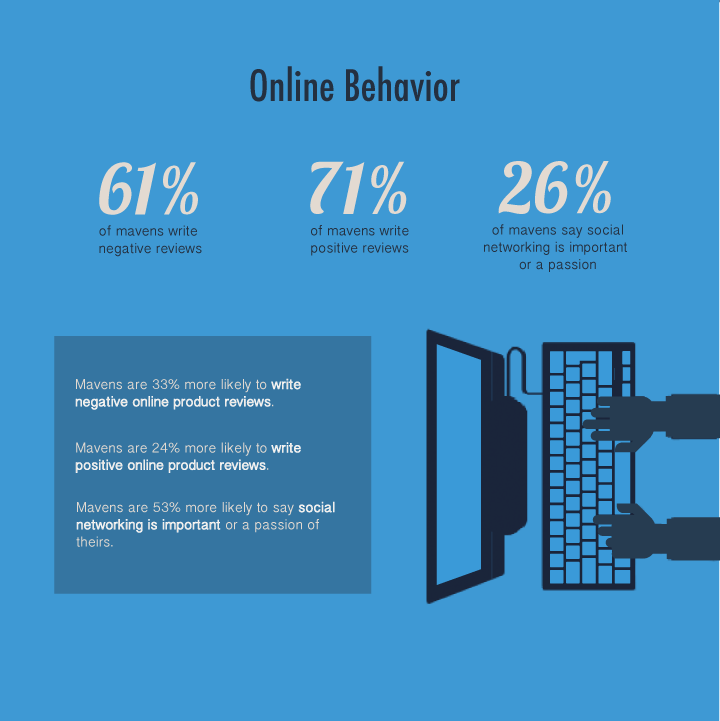 In the shopping category, Market Mavens are 45% more likely to always seek out online reviews before making a purchase and 37% more likely to value products that expose them to new things. On the evangelizing front, they also love to write reviews: 61% of them write negative reviews, which is 33% more than the general population, and 71% of them write positive reviews, which is 24% more than the general population. They are also 53% more likely to say that social networking is important or a passion of theirs. So how do Millennials compare to Market Mavens? Let’s take a look at the contrast between the demographically-defined group and the psychographically-defined group. First, Millennials make up only 28% of Market Mavens. 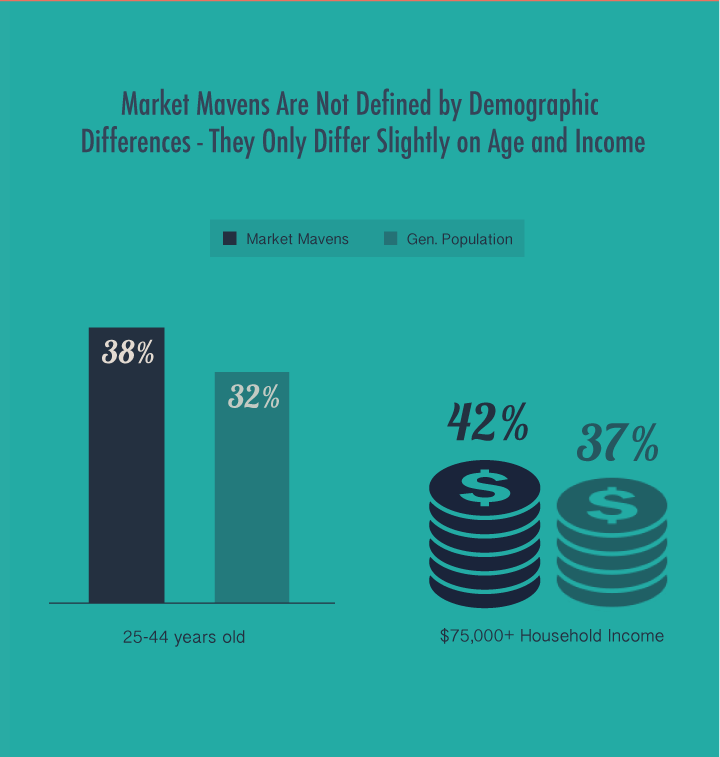 About 7% of Market Mavens are under 19, but most are older adults: 37% of are aged 35 to 54, and the rest are over 55. It should then come as no surprise that Market Mavens are also more likely to be married (48% vs. 25% of Millennials) and be parents (60% vs. 25%). Also a proxy for age, Market Mavens are 42% more likely than Millennials to earn over $100,000 per year in household income. Millennials are also somewhat more urban, with 39% of them reporting they live in the city compared to 33% of Market Mavens (although the difference here may not be as big as expected). Beyond the demographic differences is where things get very interesting. Sixty-nine percent of Millennials say they are not early adopters of new products, and 46% say they are not prone to telling others about new products and brands. Millennials spend more time on social media overall than Market Mavens and believe it’s a bigger influencer to them than ads they see on TV or on the Internet. Meanwhile, Market Mavens watch more TV, and they prefer to watch it live, while Millennials go to the movies more often than Market Mavens. And despite the age and generational differences, Millennials are only about 6% more likely to use a smart phone. Market Mavens place a higher value on brand when shopping across categories, while Millennials look more at price. When it comes to where they shop, Millennials are more apt to make all of their purchases in stores instead of online (25% of Millennials say this vs. 20% of Mavens). When it comes to diet and exercise, Market Mavens tend to buy organic food on a regular basis more than Millennials (15% vs. 9%) and are slightly more likely to exercise several times a week (39% vs. 34%). In a report we published a few weeks ago about snacking preferences, we found that Millennials overall are more likely to snack unhealthily multiple times per day, but that Market Mavens were more likely to be non-snackers. With those insights as a backdrop, makers of health-minded snack products may want to think about targeting and converting Market Mavens to snackers than to simply go after the age bucket of Millennials. Looking beyond demographics matters. Age can certainly be a proxy for many preferences, behaviors, and opinions, as can wealth, gender, and other demographic attributes, but such data paints an impartial picture at best. Demographics don’t account for the inherent personality differences that exist among consumers. Market Mavens represent a state of mind, and keeping a pulse on them and winning them over can be vital to a consumer marketing strategy. Visit here for the full, complimentary infographic about Market Mavens. CivicScience collects real-time consumer research data via polling applications that run on hundreds of U.S. publisher websites, cycling through thousands of active questions on any given day. Respondents are 100% voluntary opt-in with no compensation – they answer for fun and are kept anonymous, allowing for greatly reduced bias and higher levels of engagement. Respondents for this report were weighted for U.S. Census representativeness for gender and age, 13 years and older, and data was collected from over 11,000 respondents from January 1, 2014 through December 18, 2014. The comparative report on Market Mavens and Millennials was conducted on April 27, 2015 based on data from 21,645 poll respondents since January 1, 2014. Jennifer Sikora currently serves as vice president of Marketing at CivicScience. She has over 17 years of technology solution marketing experience, serving industries spanning retail and hospitality, manufacturing and supply chain, business and finance, and education. She is frequent guest columnist for many business and trade journals, and holds a bachelor’s degree in interdisciplinary studies/journalism from the University of Pittsburgh.